Cyberpunk 3776 harkens back to the glory days of arcade shoot-em-ups. It all begins on a postapocalyptic earth and proceeds into space. Ultimately, your journey will be a metaphor about life and death, a road that every person has to walk down alone. The only choices you get while on your path to the inevitable end: keep your head up high or forfeit. The game features a bold atmosphere with seven unique stages. Each of them includes a unique boss that will challenge your skills. Cyberpunk 3776 boasts hours of breathtaking action, ship upgrades and floating healthpods. All hope is gone - just one last Battle left to fight. It's been a little bit quiter durring the last weeks since I had to attend other things in my life but dev is still going on. I lately implemented a ingame helpsection which will be available as an Pilot Handbook.pdf comming with the full Game. After reworking the Mainmenue and Optionsscreen I currently making good progress on the Stage Backgrounds and Bosses. Actualy I hope to complete the Boss for Stage 5 today, what only leaves the Endboss to remain on my "todo-Boss-creation-List". As completion of my Shut em Up is getting closer I can really use your support in spreading the word - so if anyone want to support the Game by Streaming, doing Lets Play Videos on Youtube or just sharing it on you favorit Networks like Forums, Twitter and Facebook it would be much appreciated. The instructions presentation is looking very artistic, I liked it. 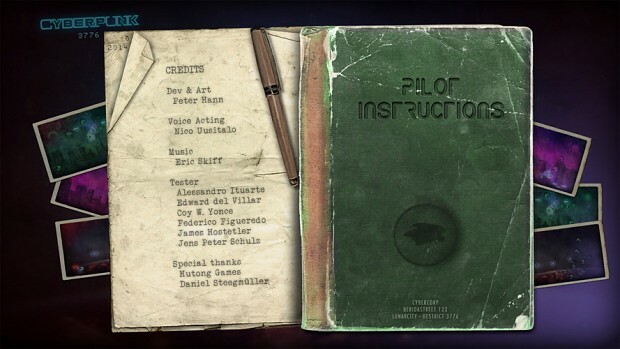 One could just make a black box with some text instructions and maybe some images but you made it in a way the player really feels he/she is a pilot reading a manual.